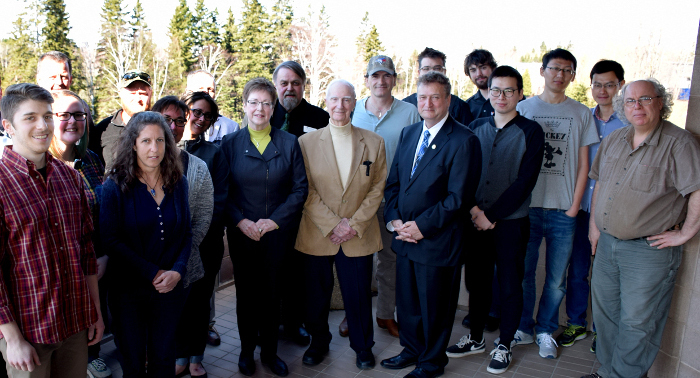 Dianne Miller, front row centre, former general manager of the Forest Ecosystem Science Co-operative Inc., celebrates the Dean's Forestry Award with Lakehead President and Vice-Chancellor Dr. Brian Stevenson, Dr. Ulf Runesson, Dean of the Faculty of Natural Resources Management, and faculty and students from Natural Resources Management on the President's balcony overlooking Lake Tamblyn. Lakehead University has received a gift that will last forever. The Forest Ecosystem Science Co-operative Inc. recently dissolved, and it has given a $100,000 gift from surplus funds to create the Dean’s Forestry Award at Lakehead. The Forest Ecosystem Science Co-operative Inc. Dean’s Forestry Award will be given to a student with a keen interest in forest sustainability in their first semester in Lakehead’s Honours Bachelor of Science in Forestry program. As long as the student maintains an 80 per cent average or higher, he or she will continue to receive the Forest Ecosystem Science Co-operative Inc. Dean’s Forestry Award for each of the four years they are an undergraduate student at Lakehead University until graduation. A new student will receive this award every four years. The award amount is generated from the interest derived from the gift, meaning values will vary, but it will be approximately $3,500 in 2017/18. Because this gift is an endowment, it will last in perpetuity and benefit future generations of students. “By establishing this award as an endowment, Forest Ecosystem Co-operative Inc. has created an exceptional legacy that will last forever,” said Dr. Brian Stevenson, Lakehead’s President and Vice-Chancellor. Dr. Ulf Runesson, Dean of Lakehead’s Faculty of Natural Resources Management, said this will be a great benefit to students. “When industry invests in our students – especially early on in their academic journey – it enhances the level of professionalism and confidence in our graduates,” Dr. Runesson said.